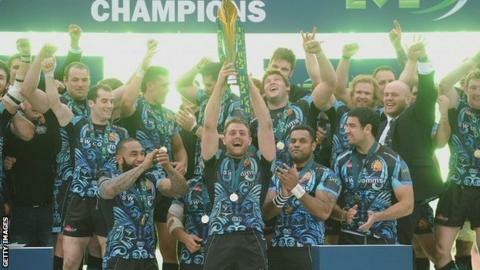 LV= Cup holders Exeter Chiefs face a trip to Leicester Tigers in this season's semi-finals. Saracens host Northampton Saints in the other semi, a repeat of the 2014 Premiership final. Exeter beat Northampton 15-8 in last year's LV= Cup final at their Sandy Park ground. Exeter finished top of Pool 4 despite Sunday's 35-18 defeat at Saracens, whose victory edged them ahead of Gloucester at the top of Pool 1. The ties will be played on the weekend of 14-15 March. Northampton, who will stage the final at Franklin's Gardens on 22 March, finished top of Pool 2 thanks to Saturday's 29-6 home win over Wasps. Cardiff Blues slipped to second in the group with their club record 43-9 home defeat by Leicester on Saturday. Leicester had already qualified for Sunday's draw as winners of Pool 3.